Veteran screenwriter Ricky Lee was recently honored with a Lifetime Achievement Award in Scriptwriting by the International Film Festival Manhattan (IFFM) in New York. 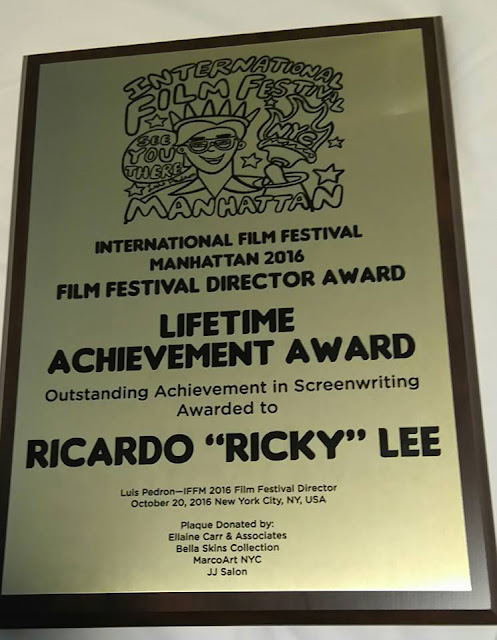 Lee personally received the plaque of recognition from festival director Luis Pedron last October 20 during the IFFM awards night held at the Kalayaan Hall of the Philippine Center in New York City. The award-winning writer also conducted a scriptwriting workshop from October 17 to 19 at the Producers Club Theaters & Bar. He has been holding workshops in the Philippines since 1982, producing hundreds of graduates who are now part of the movie and TV industry. He has mentored several budding writers and he vows to continue to help more of them reach their full writing potential in his upcoming workshops. 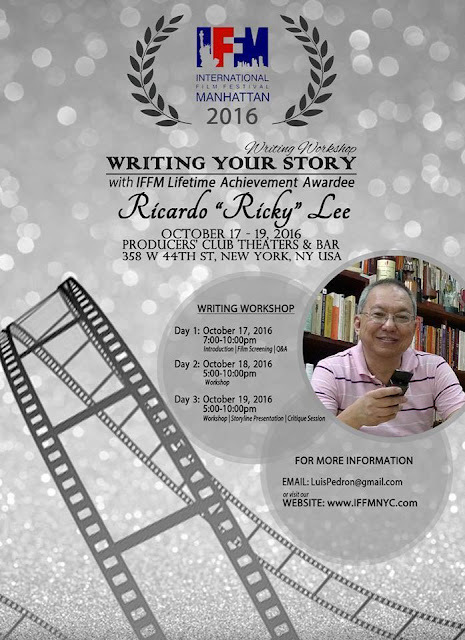 Lee has written more than 160 scripts for Filipino films since 1973. Many of these have won awards here and abroad. 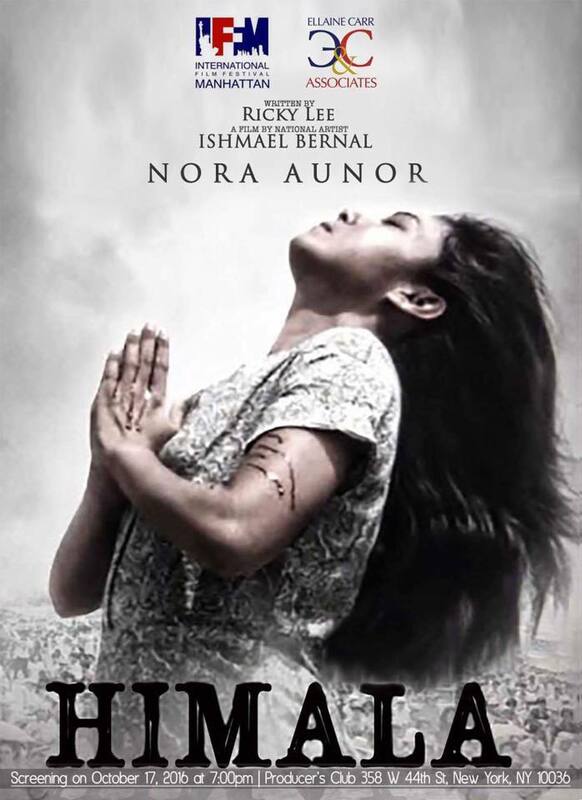 Among them are Himala, Karnal, Moral, Salome and other films directed by acclaimed Filipino filmmakers, including the late National Artists for Film Lino Brocka and Ishmael Bernal. Aside from being a screenwriter, Lee is also a book author, fictionist and playwright. He has written Trip to Quiapo, a scriptwriting manual; Si Tatang at mga Himala ng Ating Panahon, a collection of short stories; Pitik-Bulag Sa Buwan Ng Pebrero, a playbook; the novels Para Kay B (O Kung Paano Dinevastate ng Pag-ibig ang 4 out of 5 sa Atin) and Si Amapola sa 65 na Kabanata; and screenplay books like Brutal/Salome, Moral, Bukas May Pangarap and Jose Rizal. His script for Salome has also been translated into English and published by the University of Wisconsin for its film studies. Lee has received more than 60 trophies from various award-giving bodies, including the Cultural Center of the Philippines (CCP) Gawad Para sa Sining, UP Gawad Plaridel, Natatanging Gawad Urian from the Manunuri ng Pelikulang Pilipino, and a similar Lifetime Achievement Award from the Cinemanila International Film Festival. 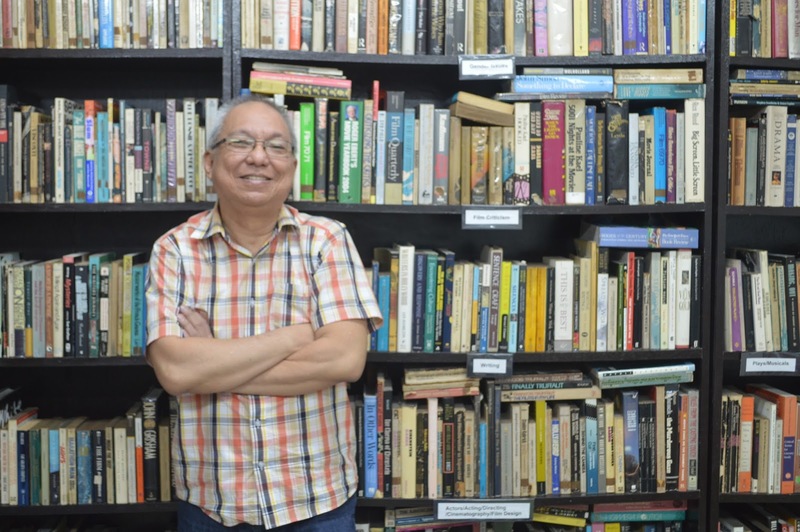 He was also one of the recipients of the Centennial Honors for the Arts from the CCP and the Gawad Pambansang Alagad ni Balagtas for Tagalog fiction from the Unyon ng mga Manunulat sa Pilipinas (UMPIL). At ABS-CBN, he has worked as Creative Manager, handling dramas for television such as Mangarap Ka, Maging Sino Ka Man, Vietnam Rose, Ysabella, Lobo, Magkaribal, Imortal, Kahit Isang Saglit and The Greatest Love. The week-long IFFM showcased 11 narrative feature films, 32 shorts and two documentaries from the US, Spain, China, Mauritius, Australia, Germany, Canada, Argentina, Finland and the Philippines (SBS).